I have been writing the Fear No Project blog for three years now — over 150 posts. When I began, I was not sure that I had all that much to say or that I would have the time to create the kind of blog I could be proud of and others would find useful. Now I can truthfully say that I enjoy the process, the interaction of comments and the result. I know that a significant contributor to my good feelings about the blog is the comments, shared information and suggestions from readers. I sincerely appreciate the time many of you have taken to add your knowledge to this community of practice. 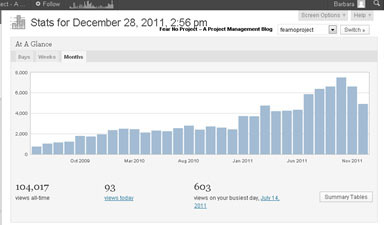 In 2011, we achieved a milestone of having 100,000 page views — I am humbled. Page views increased monthly – that sure was reinforcing! Do you need a PMO (Project Management Office)? The project management news in 2011 included much discussion about moving applications, communication and data to the cloud. Small and large organizations increased their interest in software development approaches that would allow more customer focused applications and faster turnaround from concept to development. There was also continuous discussion in the media and on the web about the impact of social media and mobile devices. Fear No Project talked about all of these in addition to posts on content, risk and resource management. We talked about project manager career planning, professionalism and continuous learning. And of course, there were many posts on the minutiae of managing people and projects effectively. Don’t ask me! I don’t know. Inspiration for post topics happens from listening to employees, talking with clients and colleagues, reading, even eavesdropping at the airport. Clients ask questions or a stranger will make an observation that may provoke a post. Additionally, the comments and questions that readers pose get me to thinking. So, if you have an area of project or general management that you think our community would find interesting, provocative or educational, do not hesitate to make a comment and tell me. I would like to take a moment and thank two key people for their support, edits and thoughts on the Blog – Karen McGraw and Barbara Brown! Meanwhile, I hope you and yours have a safe, happy and productive 2012!